Don’t you just love it when you finish a good book and want to tell everyone you know to read it? 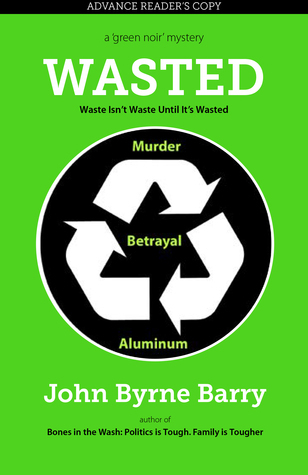 That was definitely my experience with John Byrne Barry’s second novel Wasted: Murder in the Recycle Berkeley Yard. I had had the good fortune to review Barry’s first book Bones in the Wash: Politics is Tough. Family is Tougher for the Bay Area Independent Book Publisher’s Association [BAIPA] 2014 Book Awards competition, and was hooked on Barry’s storytelling panache. He builds drama from his own unique experiences and the real characters he creates. Bones offers both information and insights into community politics in New Mexico during the 2008 presidential primaries, and Wasted provides the same type of details about recycling efforts and liberals and protests in Berkeley, California. Barry spent time working in both these fields. But this review is focusing on Wasted, whose main character Brian Hunter narrates his encounters with homeless people picking up cans and defending their territories, friends trying to keep a small recycling business afloat, employees and managers in a large international waste management corporation, and three women including his estranged wife. Brian is a 40-year-old “loser” to many because he’s not built a success on many fronts. He’s trying to put things together writing $200 a week stories for a weekly newspaper while living in his warehouse office, taking showers at the Y, and riding his bicycle and public transportation to his appointments. No spoilers here, but Brian gets himself involved in some pretty rough stuff as well as some romantic encounters. Author Barry does a great job describing both – and adding the kinds of surprises that made me want to read every word and get to the end result. I can’t wait to see the movie. Sign into Goodreads to see if any of your friends have read Wasted.